How much water does it take to make our favorite foods? This post originally appeared in the monthly newsletter of Morris Grassfed Beef. It has been modified for localfood.wordpress.com. To sign up for our monthly newsletter, click here. We often hear about the large amount of water it takes to raise cattle. The numbers are huge but almost always simplistic. No doubt, a cow needs water to thrive, but we don’t see Morris Grassfed Beef as a detriment to the water cycle. In fact, we think Morris Grassfed Beef actually enhances the water cycle by producing healthy rangelands that capture and hold clean water, which then flows to the ocean and surrounding community. The question is not so much “How much water does it take to raise beef?”, but rather “Is the beef you are purchasing helping to slow down the water cycle or speeding it up?” Our goal is to slow the water cycle down, capturing and storing this precious resource where it can nurture the soil. Our cattle drink from natural springs and creeks, filled by rainfall (when we have it!) and consume approximately 10 gallons a day, per cow. (We had to haul water from the best producing springs to the herd in the Fall/Winter of 2013/2014, for there was no other water on the ranch, so we know exactly how much the cows were drinking.) That’s 3,650 gallons per cow, per year. It takes about two years to raise a cow, totaling 7,300 gallons. Divide that amount by the pounds of beef produced from a single Morris Grassfed cow, approx. 360, and you get 20.28 gallons of water needed to produce one pound of Morris Grassfed Beef (or 6.76 gal. for a 1/3 lb. burger). Our abattoir and butchers also use water to wash the carcasses and clean their facilities, which we factored in to our final calculation of 7 seven gallons per burger. Conventionally raised beef takes more water because the cattle are fed water-intensive corn and alfalfa crops, and drink from imported water in feedlots rather than natural springs and creeks. Unfortunately, as soon as cattle are placed in feedlots they can no longer contribute in a beneficial way to the water cycle. Consider also, the number of calories and nutrients each of these foods provide. Although a head of lettuce takes about the same amount of water as a pound of Morris Grassfed, while supplying only about a quarter of the calories, a Morris Grassfed burger packs essential Omega 3 fatty acids, amino acids, and other vitamins and minerals necessary for a healthy brain and body. 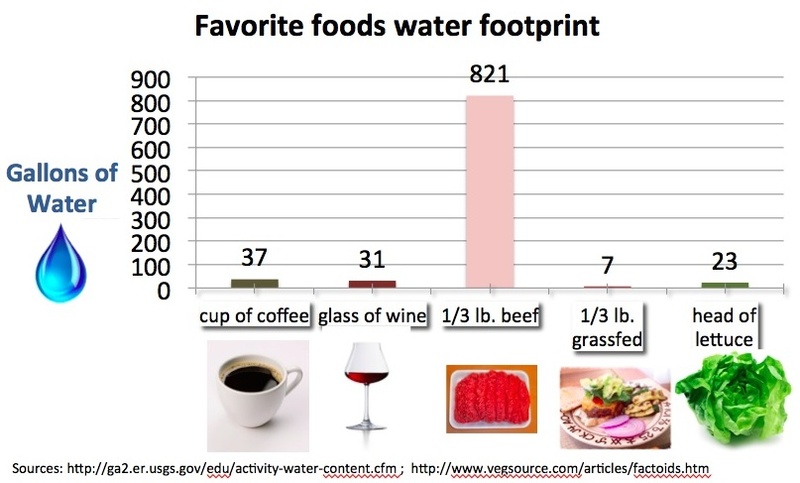 We love a glass of red wine as much as the next person, but it takes more water to make than your Morris Grassfed hamburger. Finally, if the more than 4,500 acres of rangeland that are managed by us is improved so that each acre, approximately the size of a football field, captures an extra inch of rainfall that would be an additional 27,166 gallons per acre, a huge net gain by management of Morris Grassfed Beef. This is not at all inconceivable. Your hamburger is a boon to your family’s health, your community and the water cycle. So, the next time someone tells you beef uses too much water, give them our number.